In this chapter, the concept of coverage control is introduced and vehicle motion control strategies are developed. It will be shown that the full coverage of a mission domain is equivalent to the detection of all the unknown objects within that domain. A literature review on cooperative coverage control is provided in Section 2.1. Section 2.2 studies deterministic Lyapunov-based coverage control. 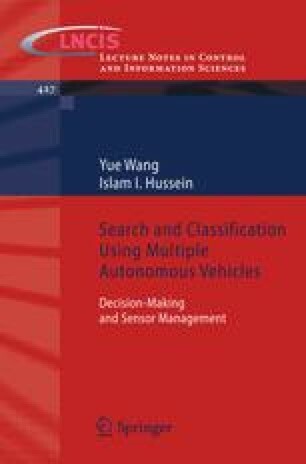 The limited-range sensor model and vehicle motion control laws presented in this section lay a foundation for all the strategies proposed in this book. Extensions and applications on underwater optical and acoustic seafloor mapping are then discussed. In Section 2.3, a deterministic awareness-based coverage control scheme is presented. The search strategies are designed in a way such that the MAVs achieve full awareness of events occurring at each point within the search domain. Section 2.4 presents the probabilistic Bayesian-based coverage control laws that ensures zero information uncertainty of the search domain (i.e., detection of all objects). This framework is constructed by discretizing the search domain into cells and takes into account the uncertainties in sensor perception. Based on the search strategies proposed for a single vehicle sensor, the results are extended to MAV systems.